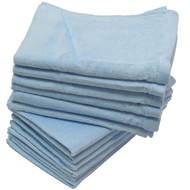 Description: Excellent quality wholesale Sky Blue color fingertip towels available in bulk pricing. These Light Blue colored fingertip towels are terry velour. Perfect to screen print & embroider on. Make excellent Rally towels and Gifts. 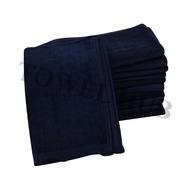 Description: Excellent quality wholesale fingertip towels in Navy color. Bulk offer, sold by the dozen. Terry Velour fabric. Excellent to screen print and custom embroider on. Can be used as Rally towels, Spirit towels by teams and for sports. Great price offer! 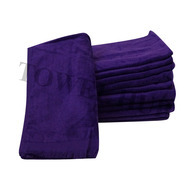 Description: Purple Fingertip towels with Fringed Ends on a bulk wholesale price offer. Terry Velour fabric, excellent to screen print and custom embroider on. Can be used for sports as rally towels, spirit towels. Great bargain here! Description: Excellent quality towel with terry loops on one side and velour on the other side. Add a brass grommet & hook to make it a golf towel. Perfect to use as a Rally towel. Can be printed or embroidered on. Great price offer! 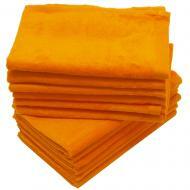 Description: Wholesale Orange Terry Velour Fingertip Towels. One side is velour and the other side has terry loops. Perfect for printing & custom embroidery. Add brass grommet + hook for Golf towel. Ideal to use as rally towels. Great price offer!!! Description: Black Rally towel terry velour with Fringed Ends. One side of towel has terry loops and the other side is soft velour. Excellent quality! Perfect to Screen print and embroider on. Description: Hunter Rally Towels terry velour bulk with Fringed Ends. One side of towel has terry loops and the other side is soft velour. Excellent quality! Perfect to Screen print and embroider on. Description: Navy Rally Towels terry velour bulk with Fringed Ends. One side of towel has terry loops and the other side is soft velour. Excellent quality! Perfect to Screen print and embroider on. Description: Red Rally Towels terry velour bulk with Fringed Ends. One side of towel has terry loops and the other side is soft velour. Excellent quality! Perfect to Screen print and embroider on. Description: Wholesale Beige / Natural Fingertip Towels fringed ends 11x18, 1.5 Lb towel in natural color. Excellent towel for embroidery and screen printing. Wholesale prices available. Description: Excellent White color Rally towels terry velour with Fringed Ends. One side of towel has terry loops and the other side is soft velour. Excellent quality! Perfect to Screen print and embroider on. 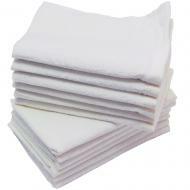 Description: Terry Velour White Hand Towels in Bulk. One side of towel has terry loops and other side is plus velour. Ideal for any high-end use. Ideal to screen print or embroider on. Add a Brass grommet & hook to make a Golf Towel. Available at great prices here!!! 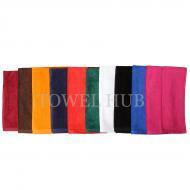 Description: Wholesale Hemmed Fingertip towels & Rally towels. Terry Velour fabric. Great for Embroidery, Screen Printing or any other use. Add a grommet & hook and it becomes a golf towel. Available at a great wholesale price! Description: Wholesale Terry Velour Fingertip Towels 11x18 Fingertip towels in various colors. Perfect for embroidery, screen printing or any high-end use. Available at a great price!